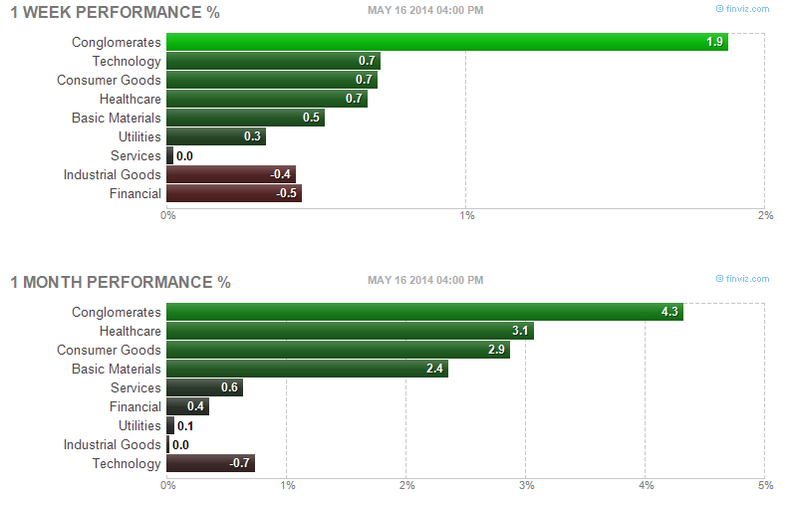 Find best performing sector stocks of week 20 of 2014. Top stock industries are Home Health Care, Internet Service Providers, Networking & Communication Devices, etc. This post will look into the top performing stocks, industry, sector, and market capitalization. Major market indices have turned negative or flat in 2014. The S&P 500 index has a weekly return of 0.03%. NASDAQ Composite has a weekly return of 0.46%. The Russell 2000 has a negative return of -0.34%. Looking into best weekly stocks can provide an insight what stock market will bring for the next session. Retail or institutional investors may want to rotate to this sector to avoid negative returns. Can growth stocks make a comeback in 2014? Will value stocks continue to thrive? Some great sectors in 2014 are major airlines, real estate (REIT), semiconductors, utilities, etc. Looking into the top sectors, you can find only technology sector is the worst performer for this week. Is this a continuation of downtrend for this sector? Whether you are a momentum or value investor, you need to be vigilant for next several weeks.